I thought I’d share a few tips and tricks that I’ve picked up along the way with SQL Server Management Studio. These are some of the features which I’ve found to be useful, but which are perhaps less well known. I’ve not included any T-SQL features as this article is specifically about SSMS. These are my top features but if you regularly use SSMS I'm sure you will know of at least some of these, I'd also be interested to know of any other useful features that you use. Please reply in the comments section below if you can add any other tips. 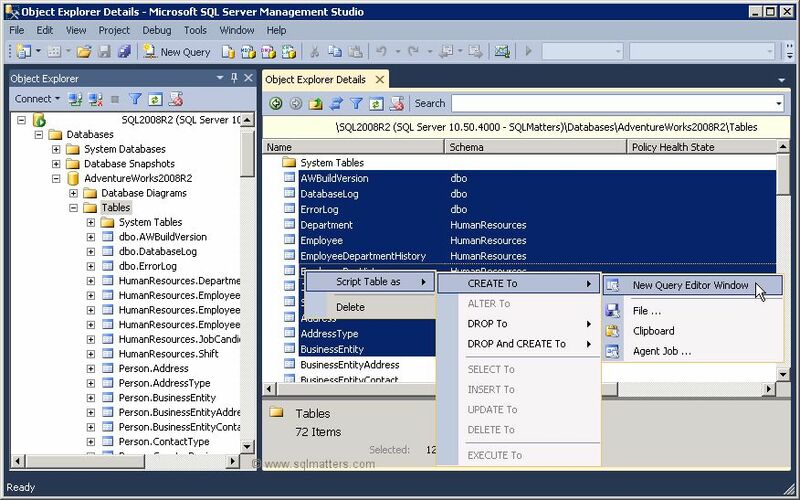 I've already covered this in another article (see : Splitting the query window in SQL Server Management Studio) but the query window in SSMS can be split into two so that you can look at two parts of the same query simultaneously. Both parts of the split window can be scrolled independently. This is especially useful if you have a large query and want to compare different areas of the same query. To split the window simply drag the bar to the top right hand side of the window as shown below. It can be useful to add line numbers to the query window, especially for larger queries. To switch on the display of line numbers click on the Tools -> Options menu item. 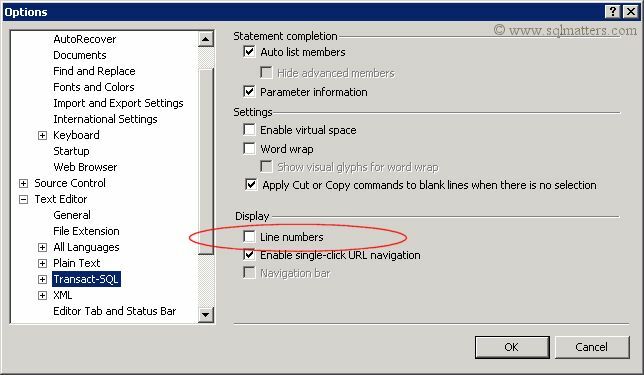 In the dialog box that appears click on Text Editor and then Transact-SQL in the left hand pane and check the Line numbers check box in the right hand pane. It may not be immediately obvious but you can switch columns around in the results pane when using the grid view, by dragging the column headers and dropping them next to another column header. This can be useful if you want to rearrange how the results are displayed without amending the query, especially if you have a lot of columns in your resultset. If you want to list all the columns in a table as a comma separated list (perhaps as the starting point for a SELECT clause) simply drag the ‘Columns’ item in Object Explorer and drop it onto to a query window. A list of all columns separated by commas will be displayed in the query window, as shown below. This will run the insert statement 10 times and therefore insert 10 rows into the TestData table. In this case this is a simpler alternative than creating a cursor or while loop. By holding down the ALT key as you select a block of text you can control the width of the selection region as well as the number of rows. There are a couple of situations where I’ve found this to be very useful. The first is to delete a block of text, for instance if you want to delete all the schema/table references in the column list below, simply highlight the table references while pressing the ALT key, so that the text shown below is highlighted. SQL Server Management Studio has the capability of colouring the bar at the bottom of each query window, with the colour dependent on which server is connected. This can be useful in order to provide a visual check of the server that a query is to be run against, for instance I like to colour code production instances as red, development as green and amber as test. This can also be used in conjunction with Registered Servers and CMS (Central Management Server). 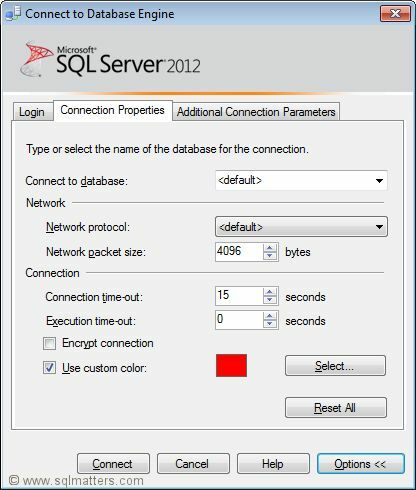 To add a colour bar when connecting to the server click on the Options button in the Connect to Database Engine window and then select the Connection Properties window. Select the check box towards the bottom of the window and use the ‘Select…’ button to choose a colour. If you have a lot of servers then re-entering the details in Object Explorer every time you start SSMS can be frustrating and time consuming. Fortunately there are two facilities within SSMS that enable these details to be entered just once and “remembered” each time you open up SSMS. These two facilities are Registered Servers and Central Management Servers. These were introduced in different versions of SQL Server and work in different ways, each has its own advantages and disadvantages so you may want to use both. 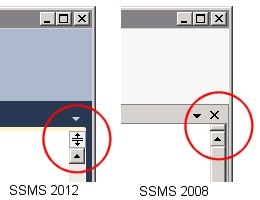 To add a registered server open the Registered Servers window from the View menu (or click CTRL + ALT + G), the window should appear in the top left corner of SSMS. Right click on the Local Server Groups folder and select ‘New Server Registration…’. Enter the server details and close the window. This new server should then appear under Local Server Groups, you can then right click and open up the server in Object Explorer or open a new query window. The server details are stored locally in an XML file and so will appear next time you open SSMS. If you have a lot of servers then you can also create Server Groups to group together similar servers. One advantage of creating groups (other than being able to logically group similar servers together) is that you can run a query against all servers in the group, by right clicking the group and selecting ‘New Group’. Central Management Server are similar to Registered Servers but with some differences, the main one being that the server details are stored in a database (the Central Management Server) rather than a local file. A significant limitation with CMS is that the CMS server itself can’t be included in the list of servers. Congratulations for tips . Some of them i didnt' know. SSMS is a great tool, but one think makes me nervous, that is to copy a result of a query to EXCEL. If you "select all" "copy & paste" , Excel convert fields like 011 to 11 and it's not a soluition. Other way is to save in CSV , and call CSV file ... too much work. Or use the OLD" interface of EXCEL(microsoft query ...) ... to much work to configure.. I would like to know a fast way to put a result of a query in EXCEL , like i see in SSMS. It sounds like Excel is treating the value as a number, and stripping off any leading zeroes. I've not tried this, but before pasting the data if you select all the cells in the spreadsheet and format every field as text then maybe it will preserve leading zeroes ? It's worth trying anyway. For that case it works, but there is more situations.. When you pass money(2 decimals) values for SSMS , it passes with 11.00. Since excel works with ",",i've to replace "." with "," to excel assume Numbers ..
What i mean is why SSMS , doesn't have a option to copy directly to EXCEL and only have CSV option.. Thanks for the reply. An SSMS export to Excel would be useful, but I guess they wanted to keep things simple - although CSV has limitations it is supported by all versions of Excel, so there are no compatibility issues with versions and file formats etc. Another thought, you could use the Import and Export Wizard in SSMS to extract the results of a query directly to an Excel spreadsheet, though I appreciate that's probably not really the solution you want. Your article again proves that with SQL Server, every day is a school day: Item 6 was a new one for me. For item 6, hold down Alt + Shift then move your keyboard arrows around selected area to get this to work. But great tips, thanks ! # 6 works in most text editors in windows (not notepad). #4 will be useful for sure. three result sets are produced in one tab or window, but to copy them it is necessary to copy each one separately. Is there a way to copy all of them at once? Why don't you format the Excel table exactly how you want the data to be formated. Only then will you get a good import of a CSV file. Don't fight with the data after the import, that is crazy man! Take one row and the format all the cells using it. . Thanks for sharing. Very helpful! Came across your blog some time ago and have used your #6 option many, many times since then. and so much thanks to Master, these 10 tips are helpfull. thanks a lot! Good stuff thanks. Why is the object explorer window not getting any cross hair so it can be resized from right to left? I want to reduce the width of the object explorer window but am unable. This is a tool pack that extends SSMS with many essential features aimed not only boost developers' productivity but also reduce expenses while performing routine tasks. When I paste results to Excel I just paste first then format any columns that need to text fields and paste again.